In 2nd grade geometrical shapes for kids we will discuss about different kinds of shapes. Some basic geometry shapes are shown so, that kid’s can recognize the shapes and practice the different geometrical worksheet on shapes. We see a variety of shapes in objects. Objects mostly have one or more geometrical shapes like the following. These types of shapes are called three dimensional (3-D) shaped solids. All these geometrical shapes have faces. We have learned about faces like triangular faces, rectangular face, square face and circular face. All these faces are flat but some are curved. The cylinder, sphere, cone etc. have curved faces. ● The faces of a cuboid are either rectangular or square. Thus, a cuboid has all 6 faces flat. ● All the faces of a cube are flat. So a cube has flat faces. ● A sphere has one face and this face is curved. Thus, a sphere has a curved faces. ● A cylinder has three faces. If a cylinder stands erect, its bottom face and top face are like circles. 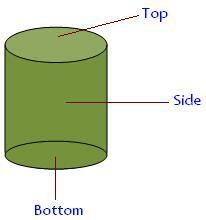 The bottom and top faces of a cylinder are flat. The third face is a curved face. A cylinder has three faces. ● A cone has two faces. One is curved and the other is circular and flat. ● A prism has five faces. Three faces are rectangular and two faces are triangular. All the five faces are flat. Children should themselves find out from the surroundings different objects having different geometrical shapes. In geometry we term the faces of any object as surfaces. We can touch and see the surface of an object. There are two kinds of surfaces. Objects having the shape of a cuboid, cube or prism have plane surfaces. The surface of paper, top of a table or box etc. are plane surfaces. Objects having the shapes of sphere or unplained surface of a cylinder have curved surfaces. The surface of a football, cricket ball, round bottle, orange, grapes, mango etc. are curved surfaces. The uppermost portion of an object is called its top. The lowermost portion of an object is called its bottom. We may place any article on the top but now below the bottom of an object. We can put something inside a vessel, box, almirah, etc. In a bucket we can store water or some other liquid. Inside a box we place our clothes. On a tray we can have fruits or vegetables. Thus, in any vessel, box, almirah, refrigerator etc. there is empty place inside, where we can put some objects. There may be other articles inside.